Inside, there's exposed brickwork here and there, some nice black and white tiling on the floor by the bar, and exposed floorboards elsewhere. Seating is a mix of tall benches, half-height booths by the window, and row of small tables flanking the bar. It's quite small, but there's more seating outside at picnic benches around the front and side of the pub. An open kitchen is squeezed into a corner next to the bar. Kake visited on a Friday lunchtime in November 2015. There were a fair few people in when I arrived around 1:30pm, but still free tables inside (there were quite a few sitting outside, too, despite the rather grey weather). It emptied out substantially by 2pm. Music was playing, at a level where I found it hard to hear what the bartender was saying to me. Four of the six handpumps were on, with relatively interesting choices. They also had a display of bottled and canned craft beer on the bar back, and a few Meantime beers on keg taps. A pint of lime and soda was a pleasingly cheap 65p. According to the Exmouth Arms website as of November 2015, food is served 9am-10pm every day. It primarily consists of burgers photo of menu, but they also do bar snacks ("diner tapas") such as macaroni cheese and chicken wings photo of menu. Kake's veggie burger (£8 including chips or salad) photo was weirdly billed on the menu as "Pleasured By Veg", though at least the bartender didn't insist on my using this name when ordering it. It arrived on a rather twee plate with an almost comically oversized knife and fork. The burger itself was fine, and the prominent pieces of carrot helped add some texture. The bun was fine too, and stayed together throughout. The presentation was good; a slice of beetroot underneath the burger both added more texture and made sure that the salad leaves underneath didn't immediately wilt from the heat of the burger. There was cheese in there too, and they seemed to have used a matured cheese rather than the advertised mozzarella, as it had a rather more umami/aged flavour than I'd expect from a fresh cheese like mozzarella. The accompanying salad was made of interesting leaves, but could have done with a light dressing. 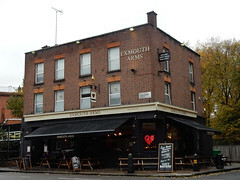 According to the Exmouth Arms website as of November 2015, there's a pub quiz every Tuesday. It also has a backpacker hostel upstairs; this may have replaced the function room that was previously available. Child-friendliness: They have at least two highchairs. Accessibility: A small step to get in at the left-hand entrance, no more than about an inch (step at the other entrance is higher). Limited freestanding normal-height seating. A step to the ladies' toilet (gents' not checked). Last visited by Kake, November 2015. Opening hours taken from the Exmouth Arms website, November 2015. Last edited 2015-11-11 10:34:17 (version 8; diff). List all versions. Page last edited 2015-11-11 10:34:17 (version 8).